Injured civilians, having escaped the raging inferno, gathered on a pavement west of Miyuki-bashi in Hiroshima, Japan, about 11 a.m. on 6 August 1945. “Tensions between nuclear-armed States are rising. Nuclear arsenals are being modernized and, in some cases, expanded,” said Izumi Nakamitsu, High Representative for Disarmament Affairs, speaking on behalf of Secretary-General António Guterres at the Hiroshima Peace Memorial Ceremony. The 6 August 1945 bombing of Hiroshima by the United States, killed tens of thousands of people, many of whom succumbed to their injuries in subsequent months. Those who survived the bombing there, and at Nagasaki a few days later, are referred to in Japan as hibakusha. “The future of our children and of our children’s children depends upon it,” she stressed. She pointed to last year’s adoption of the Treaty on the Prohibition of Nuclear Weapons as demonstrating international support for permanently ending the nuclear threat, as well as frustration at the slow pace of achieving this goal. “World leaders must return to dialogue and diplomacy, to a common path towards the total elimination of nuclear weapons and a safer and more secure world for all,” she stated. The remains of a wristwatch found in the ruins of Hiroshima, Japan, records the moment of the atomic bomb explosion at 8:15 a.m. on 6 August 1945. 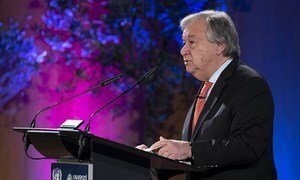 The Secretary-General is leaving UN Headquarters in New York on Monday night, to take part in the 73rd Nagasaki Peace Ceremony on Thursday. He is also due to meet Prime Minister Shinzo Abe and with Foreign Minister Taro Kono during his visit, to honour the hibakusha, and deliver his message that leaders must return to dialogue and diplomacy.